The distance between London and Berlin is 933 kilometers. 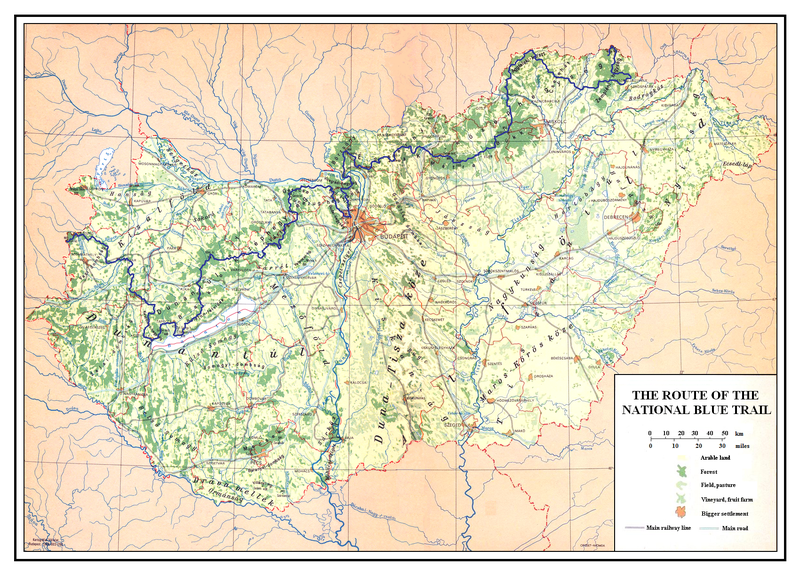 The National Blue Trail is 1128 kilometers long. 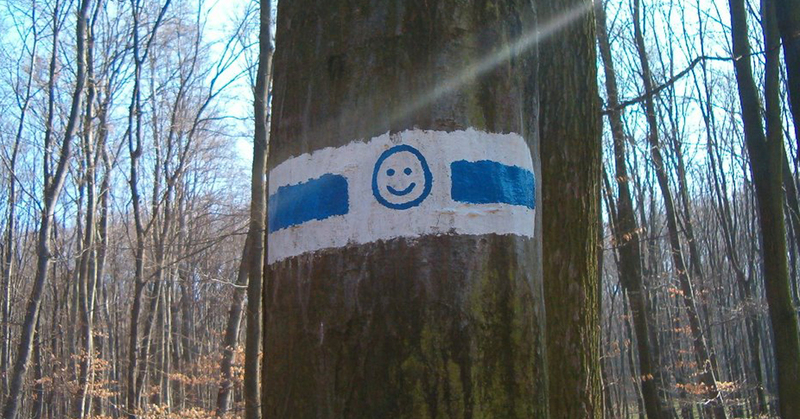 The latter is the oldest long distance walking route in Europe; it was in 1938 when the first hikers completed the horizontal blue stripe between two white stripes – marked path (yes, the trial is named after its marking). You can still follow their steps at any time of the year and walk more than the distance between London and Berlin, seeing arguably even more dazzling sceneries. Does 1128 kilometers sound too tough? The Blue Trail is not a competition. You don’t have to do it all in one go! You can buy a personal completion brochure which gives you all of the information that you require to choose your preferred section(s) of the trail to hike from a direction of your choice. You can hike or even ski run between the checkpoints and there is no time limit. The goal of the Blue Trail is to collect the stamps at the checkpoints in your brochure. Ideally, you start at a checkpoint and finish at a different one. There are 149 checkpoints and once you’ve collected them all you can send your collection to the Hungarian Ramblers’ Association (MTSZ) and in return, you will receive the infamous Blue Trail Badge! All the checkpoints, the reward of a Blue Trail Badge sounds already a lot more intriguing than most types of treasure hunt, or aimlessly wandering around playing including Pokémon Go but that is not all! There is an even bigger reward in hiking the Blue Trail which is the breathtaking scenery along the way. To make completion of the trail easier the 149 checkpoints and 1128 kilometers are divided into 27 smaller hiking trials. The longest is 74 km between Becske and Mátraverebély while the shortest is 14 km between Hűvösvölgy and Rozália téglagyár. The spectrum, you can choose from when deciding which part of the Blue Trail to hike, is extremely colorful and wide. While hiking through Hungary in a West-East direction, from the Austrian border to the Ukrainian one. The sights that you can discover throughout the route include plenty of forts, castles, and lookout towers. All with the own history and story to tell! The path leads along three World Heritage Sites in Hungary, namely the banks of the Danube and the Castle District in Budapest (or at least you can throw a glance at these sites). The old village of Hollókő and the Stalactite Cave of Aggtelek are also particularly amazing sights to behold. The Blue Trials goes along Lake Balaton, the Danube Bend, and the spent volcanoes of the Basin of Tapolca, to mention a few more of outstanding attractions that are on the way. Hungary doesn’t have huge mountains or the seaside but there is still plenty to offer and you will not be disappointed! The hills and lowlands, the magnificent Lake Balaton, the historic and rich history & culture which is more than 1000 years old, & the stories of the countrymen you’ll meet along the way are making up for that and then some! You can be sure that Hungary offers diverse and unique experiences that will enchant you. Pick a part of the Blue Trail that suits your interest most and just go for it!